The settlement founded by the Phoenicians at the mouth of the River Mazaro became anirnportant harbour in Antiquity on account of its protected position and its proximity to Africa. The trading post that so flourished under the Ancient Greeks, however, reached its apotheosis under Arab and then Norman dominion. The cosmopolitan range of different ancestries that have been attracted to this town through the ages, not least from nearby North Africa, are still much in evidence today constituting a considerable proportion of the local population. As in times past, Mazara continues to be regarded as one of the most important deep-sea fishing-towns in Italy,accounting for 20% of the National catch. Harbour and shipping canal – The heart of the town is the harbour; this throbs with life early in the morning when the fishing fleet returns with its catch. The quays jostle with activity as refrigerated trucks manoeuvre into place: the harbour echoes with the sounds of fishermen, merchants, packers and drivers who see to the off-loading, processing, packaging and dispatching of the fish. Meanwhile, the fishermen go about preparing their boats, moored to the jetty, sorting and folding the nets, stacking up the lobster-pots and stowing the cages in readiness for the next expedition. Overlooking the scene with benign approval, set back from the actual harbour front, is the Norman Chiesa di San Nicolò Regale. San Nicolò Regale – This evocative building erected under William I, has a square plan with the three apses contained by a bulbous dome characteristic of Arabo-Norman architecture (see PALERMO: San Giovanni degli Eremiti or San Cataldo). The skyline is edged with rounded battlements. Below the floor inside, fragments of mosaic have been discovered: these, from paleo-Christian times, probably form part of a Roman floor. Among the streets behind sits Piazza Plebiscito, graced with the elegant façade of Sant’Ignazio (18C) and the former Jesuit College (17C) with its lovely doorway. This currently accommodates the municipal library and a small local museum containing artefacts from various periods, predominantly from Neolithic to the late Byzantine eras. The separate Sala Consagra is devoted to a contemporary artist born in Mazara; it contains etchings, acquatints, relief panels together with small-scale modelli of his best-known sculptures. The museum also maintains a large reserve collection of paintings for which permanent exhibition space has yet to be found. Cattedrale – The main building dates from the 11C although this was subjected to considerable remodelling in the 17C. The façade, completed in 1906, is ornamented with a decorative doorway and a 16C shallow relief panel depicting Roger I on horseback, felling a Moor. Interior – The somewhat overall theatrical effect is achieved by interspersing a few genuine elements of gilded stucco decoration among frescoed trompe-l oeil stucco volutes, curlicues and little cherubs. The most complex group resides in the centre apse where a large drape richly embroidered with gold “stitching” is suspended and drawn aside by angels, to reveal the Transfiguration. The whole composition by Antonello Gagini sits upon a majestic Renaissance altar. In the first chapel on the right is an ancient ciboriumwhich may have been used, according to the inscription, at the christening of Frederick I’s son. The Chapel of the Crucifix, also right of centre, takes its name from the fine painted wooden crucifix (13C) contained in the adjoining room.Set into the floor is a glass plate, this provides a view of the ancient foundations. Elsewhere, the church contains a number of Roman sarcophagi. Piazza della Repubblica – This pleasing piazza laid out in the Baroque period acts as the focal point to the old town. 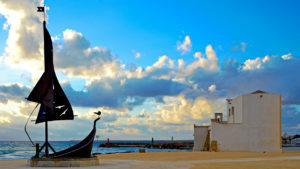 The statue (1771) gracing the centre is by Ignazio Marabitti and represents San Vito, the patron saint of Mazara. On all sides rise a harmonious collection of palazzi from the 18C: at the far end sits the cathedral overshadowed by an elegant Baroque campanile; along the left side stands the Bishop’s Palace while to the right, extends the Seminario dei Chierici complete with its lovely neo-Classical portico and round-headed arched loggia. The former seminary now houses a small Museo Diocesano(entrance at 3 Via dell’Orologio). Lungomare Mazzini – South of Piazza della Repubblica. The seafront is flanked by gardens shaded by magnolias and palm trees, making it a perfect place for the habitual Italian “constitution”. At its eastern end, Piazza Makara contains all that remains of the Norman Castle (11C), namely a pointed gateway.